Although not possessing quite the clout of Arjen Anthony Lucassen’s Ayreon or Tobias Sammet’s Avantasia projects Melted Space’s latest offering is still quite an expansive body of work. 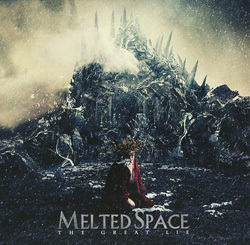 The brainchild of Pierre Le Pape, Melted Space already have two full-length releases and an EP to their name – ‘There’s A Place’ (2009), ‘From The Past’ (2012) and ‘Between’ (2013) respectively – and although the band has moved on from its original instrumental roots Le Pape has most certainly paid his dues. ‘The Great Lie’ covers all the bases from the bombastic symphonic metal you expect with such outings to some less refined but equally refreshing death metal – whatever style is necessary is called into play as befits the nature of the song. The guest list of musicians packs quite a hefty punch and the vocalists featured – amongst others; there are fourteen in total! – include the likes of Mikael Stanne (Dark Tranquility), Kobi Fahri (Orphaned Land) Ailyn Gimenez Garcia (Sirenia), Sylvain Coudret (Soilwork) and Morbid Angel’s David Vincent: not a bad set of credentials, eh? Hopefully ‘The Great Lie’ – and being signed to Sensory – will help Melted Space break out of France and reach a wider international audience, something this album so readily deserves. Stirring, stunning, spectacular… What’s not to like?